down on the grill on low heat. It only takes about 30-45 seconds for the lettuce to be charred. Remove and turn flat side up. Mix together the following in a small bowl. 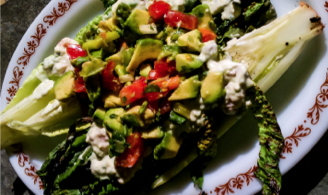 Drizzle the dressing on top of the romaine hearts and top with the dicedtomatoes and avocado. Serves 4.